Has anyone ever argued against an accident report? And won? My daughter was t-boned by a driver running a stop sign. The officer didn't do any homework of the scene or damage to properly assess fault. Their running the stop sign is what my daughter says (and the damage evidence supports). a. Blazer damage supports low speed of Blazer and high speed of Cobalt. 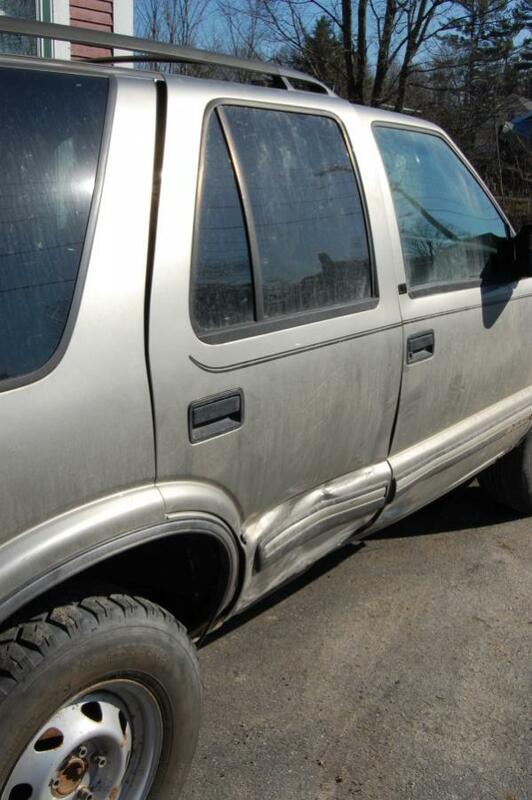 Blazer damage does not show car rubbing down the side. There is no damage to the rear quarter panel. 2. Intersection design - the cars were in the nearest lanes to each other on 2 one-way streets. Cobalt could not get enough speed in 1/2 lane to do that kind of damage to the Blazer. Just did some research and calculations. If the Cobalt driver entered the intersection from a complete stop and accelerated at full throttle, the impact speed would've been less than 20 mph. 20 mph doesn't do that much damage. Doesn't look like that much damage to me however, a slow speed would not have spun the car around. Did anyone get a ticket? Usually the person with front damage is at fault but some states have NO FAULT like in PA. The insurance company will send an investagator to the vehicles and ask your daughter what happened. Just tell her to stay calm and don't warry about it as long as she is not hurt. If she feels any pain, have her go get checked out. Thanks rspi. No tickets issued. Cop wrote on ticket unable to assign fault. All accidents are a mess. Hope your daughter is fine. When my daugter totaled my 960 they didn't raise our rates but it has taken 3 years to get her rates affordable. The thing that young drivers have to realize is that they need to try to avoid accidents as much as not cause them. My daughter was hit 2 or 3 times before she realized that. Always in a Volvo, never hurt. The only rule I gave her is to NEVER leave the road trying to avoid an accident without letting the other car contact her. That way they don't just drive away and leave you messed up alone, which happened to the 960 she totalled. An elderly lady ran her off the road and she did get contact, two days later the lady had totally forgotten about the accident and if it were not for the police report she would have been screwed. Sorry to hear your troubles. The officer that arrives on scene records the scene and involved parties statements. It is not their job to assign blame. If it is a he said, he said, w/out independant witness, and the damage is not absolutely conclusive, he will not/should not speculate fault either. There is no "investigation" for minor accidents. An officer should not change a police report at anyone's request. He may add to it, but should not change it.